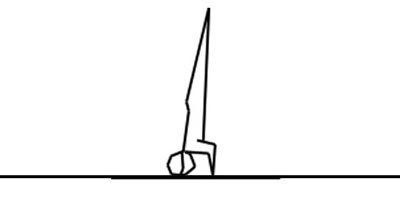 A spring floor is used in most competitive gymnastics to provide bounce. Spring floors are also used ssometimes in cheerleading. The sprung floor used for indoor athletics, however, is designed to reduce bounce. The apparatus originated as a 'free exercise' for men, very similar to the floor exercise of today.It wasn't until 1948 that women were allowed to compete on the floor. Most competitive gymnastics floors are spring floors. They contain springs and/or a rubber foam and plywood combination which make the floor bouncy, soften the impact of landings and enable the gymnast to gain height when tumbling. Floors have clearly designated perimeters—the "out of bounds" area is always indicated by a border of white tape or a differently colored mat. 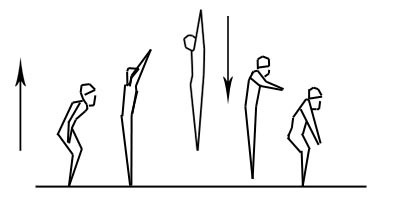 From a squat position, the gymnast should form a triangular shape with their hands and head (their head should be the top of the triangle, with their hands acting as the bases). The gymnast’s forehead should touch the floor, not the top of the head. The gymnast should slowly lift their legs from a tucked position and then extend their hips and legs to balance in an extended headstand. Support and balance are provided by the arms. 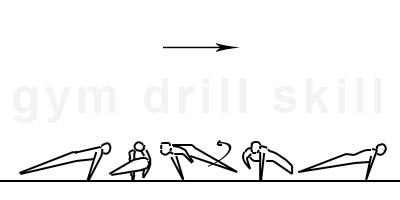 In order to perform a V-sit, the gymnast should start in an L-sit support. They should raise their legs further and compress their body into a tight piked position. This skill should be held for a minimum of 2 seconds. The gymnast’s arms and legs should be completely tight. The head should be a neutral position. 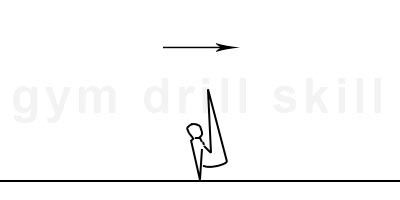 The gymnast should start in a standing position. They should squat down and place their hands on the floor. As they do this, they should tuck their head down, and perform the forward roll. Their back should roll onto the floor smoothly from the neck to their buttocks. They should finish the skill in a squat position and immediately extend their legs to a stand. 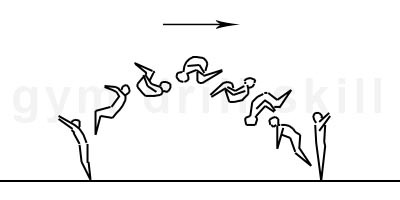 To perform a dive roll, the gymnast should run, gradually increasing their speed. They should punch off the floor with their legs tight and feet together. They should jump into the air with a straight body. At the moment of the punch, the gymnast’s arms should do a back circle and swing upwards. This arm motion will help to increase the height of the jump. After the jump the gymnast should arch their body slightly while kicking their legs backwards. They should keep their chin up with their arms slightly bent out to the side. The kick from the gymnast’s heels will help to flip them forwards. 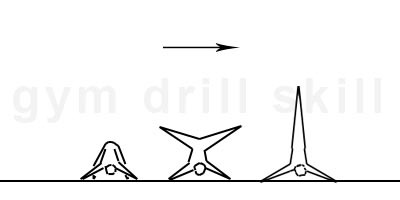 When the gymnast reaches the floor, they should be in a nearly vertical position. They should bent their arms slightly, roll forward and stand up. The starting position is from standing with the hands up. 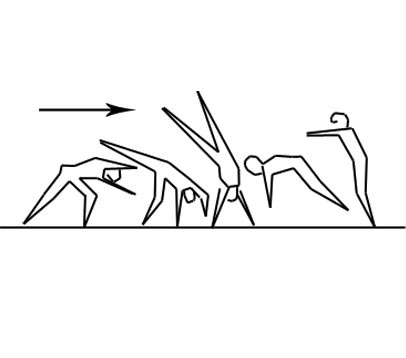 The gymnast does a step, then a lunge and puts their first hand sideways in front of the lunging leg. The back leg kicks strongly back overhead. 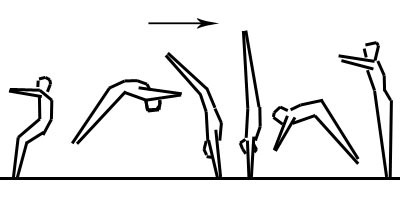 Next, the gymnast places the second hand in the same line as the legs and the first hand, the gymnasts passes through the handstand sideways in a wide open straddle. The rotation continues. 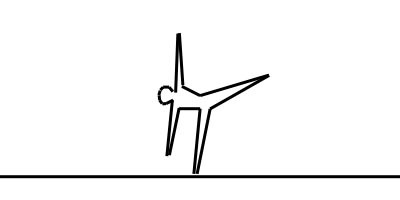 The gymnasts places the first foot on the floor, then the other one and finishes standing up in a straddle with their arms overhead. The entire rotation should be performed on one line. The shoulders and hips should be extended for the entire duration. The gymnast should start with their hurdle, raising their arms up and opening their shoulder angle. Their back leg should perform a strong kick backward. Their lunge leg should push down on the floor. As they lean forward, they should twist their first hand 1/4 before reaching the floor. The hand placement should not be excessively close or far from the feet. The lunge leg follows the back leg, where they should close together by the time the gymnast reaches handstand. 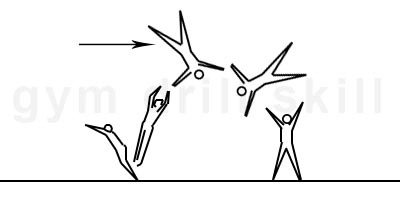 At the same time, the gymnast should continue twisting around their first arm until the second hand is placed down. This second hand should be turned an additional 1/4. Next follows the snap down. 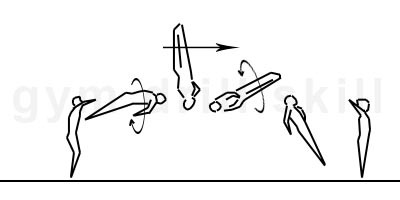 The gymnast’s body should release in hollow, with their arms extended around horizontal. Their head should be between their arms, with their feet in front, ready for a back handspring or tempo salto. 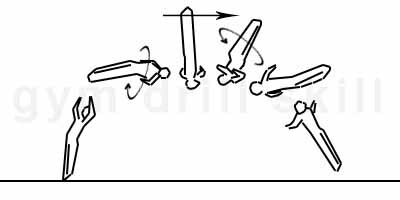 In the case of a backflip after the roundoff, the legs should arrive slightly back instead of vertical. The arms should be overhead with the head in a neutral position. The hips should be in and the body should be in a slightly arched position.